So, I about DIED the other day when I made my Gluten-Free and Vegan Lemon Meringue Pie. I mean, seriously, life was REALLY good in that moment. I couldn’t have been more proud of my culinary skills. 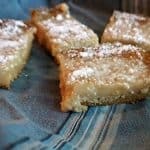 So, I decided to try to top myself this last weekend (because I’m clearly some kind of culinary-adrenaline-junkie) and make another summertime favorite: Gluten-Free & Vegan Lemon Bars. Ok, well, I mean, I guess it’ll become a summertime favorite because it’s brand-new, never before seen, kind of thing in my house. So, yeah. A NEW summertime favorite to-be. Heh. I have to admit, before I became all gluten-free and vegan on my desserts (don’t ask–it’s weird of me, I know, but just roll with me), I really hadn’t contemplated how hard it was going to be to re-imagine some of these recipes that I loved. But, oddly, these two lemon-curd recipes just came together. Both times (so the pie was not some random anomaly, but a real thing–heh). 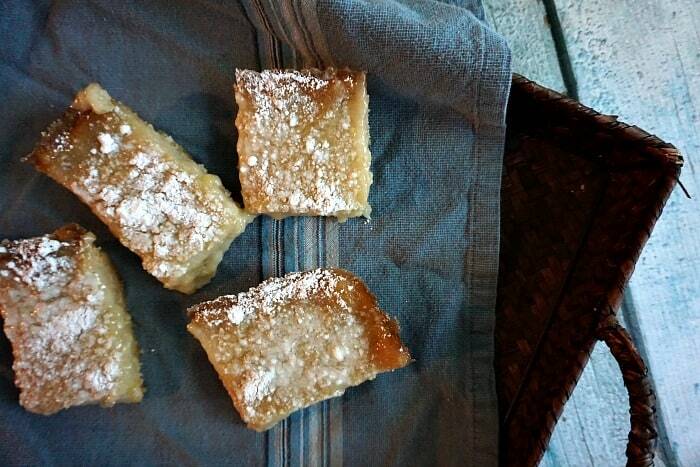 So, really, what I loved most about these Gluten-Free & Vegan Lemon Bars was the easy with which they came together. For seriousness. 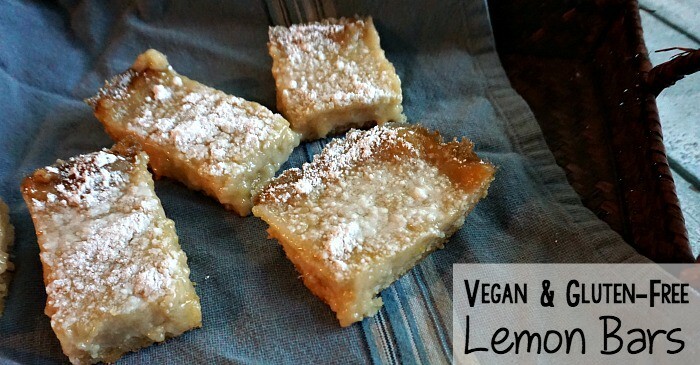 Another summertime favorite: Gluten-Free & Vegan Lemon Bars. Ok, well, I mean, I guess it'll become a summertime favorite because it's brand-new, never before seen, kind of thing in my house. Make your sugar cookie crust by mixing the dry ingredients and wet ingredients together in one big bowl and stirring until thoroughly combined. Dough will be very crumbly, but just use it anyway. Pat into a sheet in the bottom of a well-greased square baking dish (8x8). Place sugar cookie crust into the oven and bake for 10 to 12 minutes. Make the filling by straining the coconut milk, using a thin tea cloth and squeezing out as much water as you can. Resulting cream should be thick and almost like butter or soft cheese. Combine coconut milk cream and other wet ingredients for the filling in a medium mixing bowl. Combine the dry ingredients into the wet in ⅓ increments. Mix for approximately 2 minutes or until smooth. Pour filling into the crust and place in the oven for 60-75 minutes. The filling will still be liquidy and sloshy, so when you remove it from the oven, please be careful. Being very careful, remove the baking dish from the oven and place in the refrigerator for a minimum of 2 hours. Prior to serving, sprinkle generously with powdered sugar, if so desired. 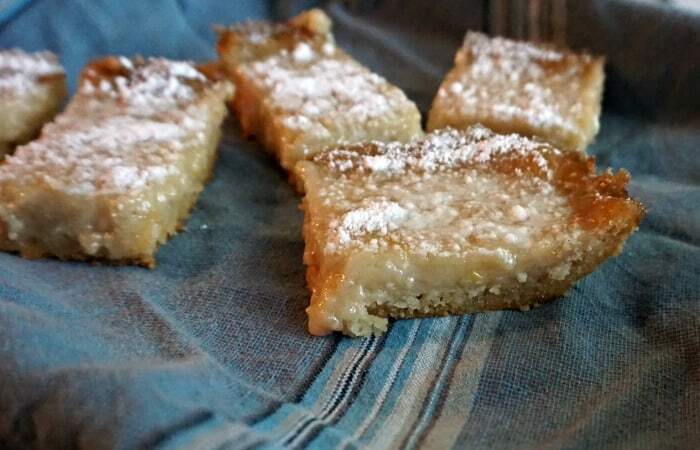 So, yeah, I’m all sad because that’s the end of my little adrenaline rush again…I mean these Gluten-Free & Vegan Lemon Bars were awesome, but they didn’t give me a high for very long. They only lasted about 24 hours in my house–what gives?! Oh, right, I have a teen boy. Heh. So, leave me a note below to let me know if you make these–and if they last longer than a day in your house! LOL!